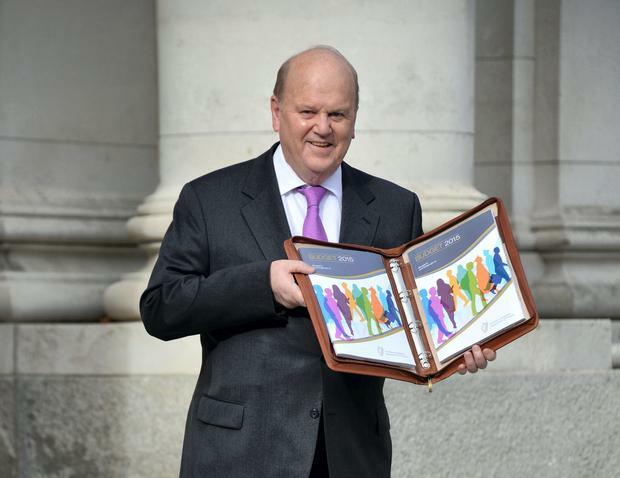 Minister for Finance Michael Noonan heads into the Dail to present Budget 2015. Photo: Barbara Lindberg. Well, it's that time of year again - no, not Halloween, or daylight savings time, not even the Rose of Tralee. It's probably my most favourite day of the year: after the Budget! And what a day it was too. There was rain, it was a Tuesday and Noonie's speech was gripping - I hung on every word. The thing we really love about the Budget is the fact that it takes days, weeks, even months to unravel it! Normally on Christmas day, we all sit down as a family and watch the Budget DVD and then decipher what it all meant. It can be such fun. Well, that's what Christmas is for! Noonie wore a delightful violet-coloured tie, which really depicted the mood. Bren also went for a similar colour so the guys were totes coordinated. Because we are farmers, publicans, milkmen and rugby players, we have to pay close attention to every aspect of it. Luckily, our discretionary spend is down 12pc year on year, so we are in a good position going forward should there be a stimulus in the economy, and MiWadi wasn't hit either, so we were rather pleased with it all. I'd say Noonie went straight to bed after the Budget with all that excitement. It's a big day, so he probably had half a pound of black pudding for breakfast. That evening in the pub, we had a Budget evening, which meant we upped the price of everything past 12 o'clock, which was a great way to get people to go home to bed. They were probably having such a good time at the Budget quiz that they didn't want to go home. I'd say if I had to pick my favourite Budget, it would be the Budget of '86. It was a good hard Budget, which added to the excitement of making savings. Most people had to use glue to keep their shoes together that year, which was very exciting! My favourite Minister For Finance would probably be Charlie McCreevy. I normally prefer when the Budget is closer to Christmas to add to the excitement, but I guess it can't be all fun. In other news, Mike Phillips text me on Wednesday to say he picked up a chicken in Iceland for 99p. Some guys have all the luck.